Wrong air discharge pipe line from the compressor can cause many fatal breakdowns. Hence I will like to share some details about designing of discharge pipe line with you. Purchasing a compressor from Atlas Copco, ELGI, Ingersoll Rand, Kirloskar, Chicago Pneumatic etc. will not guaranty you of trouble-free operation. All Engineer in an engineering manufacturing unit must have overall knowledge about the efficient running of the utilities. So, below points will better help you obtain the best performance of the compressor. Today there are many education courses offered by various institutes about piping but it requires money to invest. If you don’t want to be an Expert Piping Engineer but to know how should be the discharge pipeline required for air compressor then just go through below points. I am confident if you follow below points while designing the discharge pipeline, you can design good discharge pipeline for your air compressor. 01) Discharge Pipe Line should be the same size as shown on the General Arrangement. It should have few turns as possible. 02) The discharge pipe line should connect as directly as possible to the middle or lower part of the receiver. 03) It is advisable to design discharge pipeline system to prevent Resonance and excessive pulsations. 04) The discharge pipeline must be supported at the frequent distance. 05) In order to avoid stresses, the discharge pipeline system must be free from expansion. 06) It is essential that the pipe size should be sized to prevent excessive pressure drop to avoid power loss. 07) It is good practice to increase the pipe by one size for every 100 feet length from air compressor discharge. 08) Use long radius elbows to reduce air friction. Hence it is suggested to make all piping as direct and short as possible. 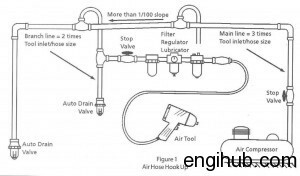 09) Never place a Shut-off valve in discharge line between receiver and the compressor. Unless a Safety Valve is inserted between the valve and the compressor. 10) Place a Shut-off valve in each discharge pipe line near to cylinder discharge. This should be done if two or more air compressors are connected to the same system.